It’s easy to miss cruising along Eastern Avenue. 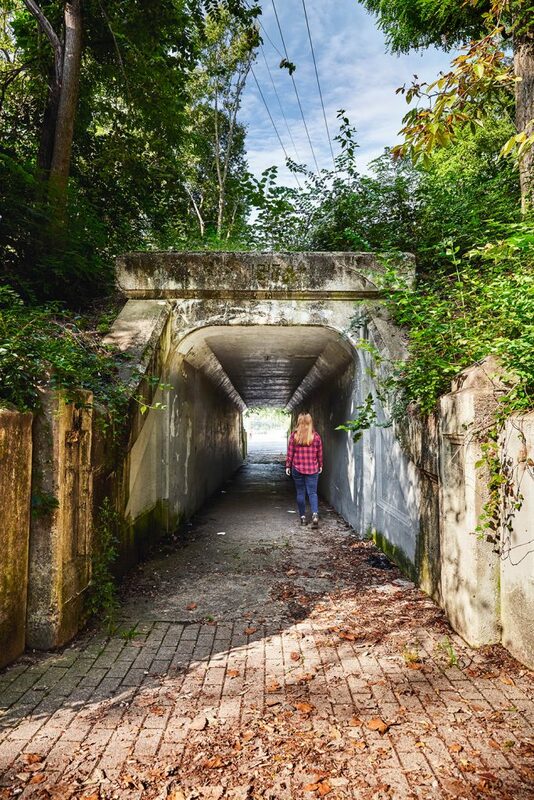 Covered in moss and untamed foliage, the entrance to this 101-year-old East End pedestrian tunnel—and its Riverside Drive twin—blends into the earthy hillside it intersects. Measuring 75 feet long and 8 feet wide, the damp tunnel connects Eastern with Congress Avenue and Stacon Street. The other, located a half-mile northwest, joins Riverside with Walworth Avenue. What’s their purpose? Saving lives. The two sets of railroad tracks that sit on the tunnels’ hilltop formerly serviced the Pittsburgh, Cincinnati, Chicago and St. Louis Railway, owned by the Pennsylvania Railroad. In May 1902, an act to abolish Ohio’s railroad grade crossings passed, forcing railroad companies to create pedestrian “subways” so people could safely pass under the tracks, instead of crossing them. Completed in 1917, the SORTA-owned tunnels continue to save lives—the Indiana & Ohio Railway still uses one set of tracks. “The tunnels are in satisfactory condition,” says Bill Shefcik, a principal structural engineer, who inspects them annually with the Department of Transportation and Engineering. How’s that for 20th-century craftsmanship? Next articleDr Know: Security Cameras in Hyde Park, 1920s Car Engines, and Where Did the Board of Elections Go?